Last week we took delivery of Art at Te Papa, the big book on the art collection. We are absolutely thrilled with it. 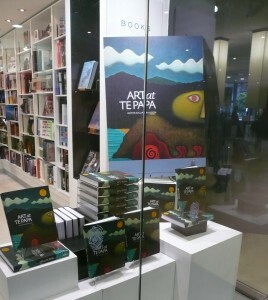 The book’s official launch isn’t until next week, but Te Papa store already has an impressive display in its window. Some numbers: The book features 419 works in the collection by 300 artists. There are 343 individual essays by 38 writers. About half the essays were written by Te Papa curators and staff, while the rest were commissioned from colleagues outside the museum. It’s been the result of about three year’s work. The flexi-bind edition weighs in at a hefty 2.6 kilos (5lbs, 11 oz). To celebrate the launch, on Thursday next week we’ll be having a special tour of Toi Te Papa with some of the contributors to the book, starting at 6pm. It’ll be a bit like a speed dating version of meet the author, as everyone will have about five minutes to talk about a work in the exhibition that they wrote about. It should be fun.